New York City. 1920. A legless beggar pleads with the oncoming foot-traffic for spare change. Barely a nickel comes his way. But what these pedestrians don’t know is—this deformed derelict at their heels is none other than Blizzard, kingpin to the seedy underbelly of the Lower East Side. With an army of dancing girls at his beck and call, Blizzard is hell-bent on executing his master plan: Get his revenge against the prominent doctor who left him in this condition—and against the city that could’ve cared less. 3 People. 4 Legs. 1 Game of Revenge. The Penalty features an ensemble cast, integrated with able-bodied and actors with disabilities with songs by composer Robert M. Johanson (Nature Theatre Of Oklahoma's Life and Times Episodes 1-4). 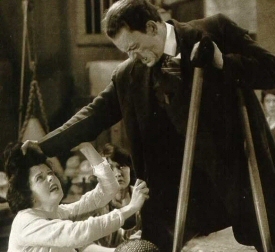 The Penalty is inspired by the novel of the same name by Gouverneur Morris, and its film adaptation, starring Lon Chaney, written by Charles Kenyon and directed by Wallace Worsley. Written by CLAY MCLEOD CHAPMAN. Directed by KRIS THOR. Music and Lyrics by ROBERT M. JOHANSON and CLAY MCLEOD CHAPMAN. Commissioned by DIXON PLACE & THE APOTHETAE. Six performances only! Fridays and Saturdays, June 14th-29th at 7:30 PM.